Major indexes on Wall Street traded in a sideways range Friday and finished little changed despite continued generally strong corporate earnings and a minor slide in Treasury yields from four-year highs earlier in the week. The S&P 500 edged up 0.11%, the tech-heavy Nasdaq was effectively flat (+0.02%) and the Dow edged 0.05% lower. For the week the S&P 500 was little changed, the Nasdaq was down 0.4% and the Dow closed about 0.6% lower. Retail stocks gained on the Friday, with the Dow Jones Retail index closing at its highest level for a month, after online retail king Amazon surged on better than expected first quarter results. Telecom, real estate and transportation stocks also showed strength, along with transportation with the Dow Jones Transportation index closing 1.3% higher. Steel stocks lagged, as did energy shares. Amazon shares gained 3.6% on Friday as its profits surprised on the upside, more than doubling from a year earlier to $1.6 billion, even as the company continued to invest heavily for growth. Its cloud computing business, along with a fast-growing contribution from ads were key drivers. The company announced its Amazon Prime subscription fee will increase $20 to $119 per year. Charter Communications shares tumbled 11.7% after first quarter earnings disappointed and it lost more TV subscribers than expected. That sparked a sell-off across the sector. Comcast fell 4.6% after reporting modest video subscriber losses earlier in the week and as investors worry about the company being tempted to overpay or overextend itself by adding 21st Century Fox to its buy list. Comcast recently lobbed an offer at Sky, trying to ruin Disney’s party. 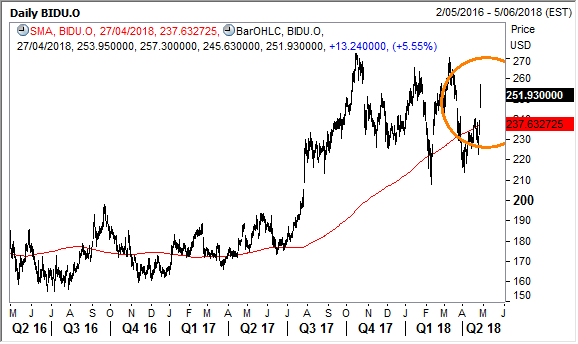 In other trading, shares of online search giant Baidu surged 5.6% after the company blew past earnings estimates when it reported first quarter numbers the night before. More on Baidu later. Logistics leviathan FedEx advanced 1.4%, Apple supplier Corning added 1.2%, homebuilder Lennar tacked on 1.0% and Barrick Gold closed 1.1% higher. Wynn Resorts ticked up 0.5%, while Disney closed 0.6% lower. Oil and gas supermajor Exxon Mobil slipped 3.8% as earnings come in slightly lower than expected. In other trading, shares of automaker giants Volkswagen and BMW gained 3.0% and 1.6% respectively, while consumer goods giant Unilever advanced 2.5%. In Spain, Telepizza shares added 1.9% and stock exchange operator Bolsas y Mercados advanced 1.3%, while Caixabank and Bankia closed 1.8% higher and 0.5% lower respectively. The world’s largest luxury goods retailer LVMH was up 1.5%, while travel technology firm Amadeus ticked up 0.8%. The megabanks Mizuho, Mitsubishi UFJ and Sumitomo were down 0.3% to 1.9% on the back of the BOJ’s update. Air conditioning giant Daikin Industries advanced 1.2%, while energy firm Inpex tacked on 0.6%. Trading house Mitsubishi Corp edged up 0.3% and Nippon Telegraph and Telephone (NTT) eked out a 0.2% gain. In Hong Kong, Sunny Optical shares rose 3.4%, recouping some ground lost earlier in the week. Telecommunications firm China Unicom advanced 2.6% gain and oil and gas major CNOOC gained 2.8%. internet giant Tencent Holdings closed 1.6% higher, while the insurers PICC and Ping An were mixed, with a gain of 2.9% and fall of 2.2% respectively. The Macau casino stocks Sands China, MGM China and Wynn Macau gained between 1.6% to 2.6% on the day. Mitsubishi Fudosan (8801.T, +1.1%) which is held long term by FPC has rallied 15% off its lows over the past month. 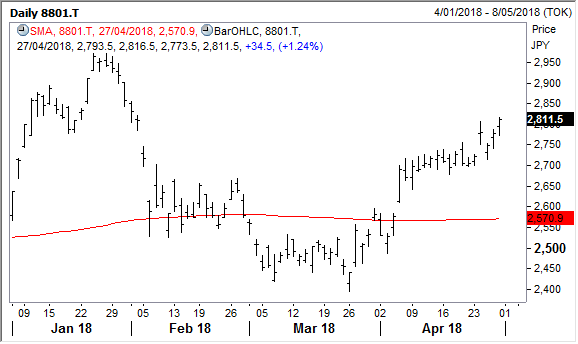 US-listed shares of Baidu surged 5.6% in trading on Friday, with it the first day for trading following the release of numbers that blew past analyst expectations after the closing bell on Thursday. The company’s outlook was also positive with revenue forecasts well above what Wall Street was anticipating. The core advertising business has its mojo back and heavy investment in areas like artificial intelligence (AI) and autonomous driving to establish new revenue streams for the future and progress has been promising. Baidu said in its earnings release that it is planning on selling a majority stake in its financial services business. Baidu’s video streaming business, iQiyi, recently undertook an IPO on the New York Stock Exchange, raising almost $2.3 billion. Unlike its plans for the financial business, Baidu has retained a majority stake in iQiyi, a business that has been referred to as the Netlix of China. iQiyo revenues surged more than 50% year-on-year in the first quarter of 2018. Baidu’s total revenues hit RMB 20.9 billion ($3.33 billion) in 1Q18 representing a 31% year-on-year increase. That topped the consensus estimate of RMB 20.2 billion. Baidu’s operating profit of RMB 4.6 billion ($728m) more than doubled (+128%) year-on-year, as costs were relatively well contained compared to a year ago. Baidu benefitted from a substantial increase in net other income, which jumped from a marginal amount a year earlier to RMB 1.86 billion in the first quarter of 2018. The increase was driven by a change in accounting treatment, which saw Baidu (and other companies) value investments in private companies at fair value. Net income attributable to Baidu almost quadrupled (+277%) to RMB 6.69 billion ($1.1b) or RMB 18.68 per diluted ADS (American Depositary Share), from RMB 1.78 billion, or RMB 4.63 per ADS a year earlier. Non-GAAP net income of RMB 57 billion represented a 139% year-on-year increase. Adjusted for one-time items, earnings per ADS came in at 16.30, well above expectations of RMB 10.57. German automaker, Volkswagen announced that their first quarter gross revenues increased 4% to 58.2 billion euros (US$70.8 billion) after they had record sales for the quarter. It was a strong start for the company taking the recent corporate restructuring and the ongoing “dieselgate” sage into account. The company’s operating profit did decrease by 4.2 billion euros, but this was mainly due to the changes Volkswagen had in accounting standards – under previous practices the operating profit for the quarter would have been higher too. Net income for the three months came in slightly lower at 3.3 billion euros versus the 3.4 billion euros of the same period last year. Herbert Diess, the newly appointed CEO highlighted that the outlook for Volkswagen’s earnings remained firm. The company is looking to generate revenue growth of 5% for the 2018 year. Recently Volkswagen underwent the biggest structural reform in the company’s history after a reshuffle of its executive management to support more nimble decision making. The strong numbers by Volkswagen once again pushed away concerns that the carmakers participation in the ongoing “dieselgate” scandal could weigh on the company’s financial performance. Japanese entertainment and electronics company Sony Corp, released their first quarter results on Friday with the company making a loss in the January to March period – due to lower mobile operations and unfavourable currency rates. Sony reported a loss of 16.8 billion yen (US$154 million) for the first quarter, a reversal from the 27.7 billion yen profit the company achieved for the same period a year ago. Sales for the quarter increased 3% to 1.66 trillion yen (US$15 billion). Sony are expecting that profit for the financial year ending March 2019 to stay at 480 billion yen (US$4.4 billion) – they see operating profit decreasing 8.8% to 670 billion yen and expect the semiconductor business to fall 39% due to a maturing smartphone market. The company had a record 490.8 billion yen (US$4.5 billion) profit for the year ended March 2018. Sony expects gaming profit to increase 7% as sales of high-margin online software compensates for slowing sales of console devices. Games consoles are normally upgraded every 5 – 7 years and one of new CEO Kenichiro Yoshida’s priorities will be the development of the PS4 successor. 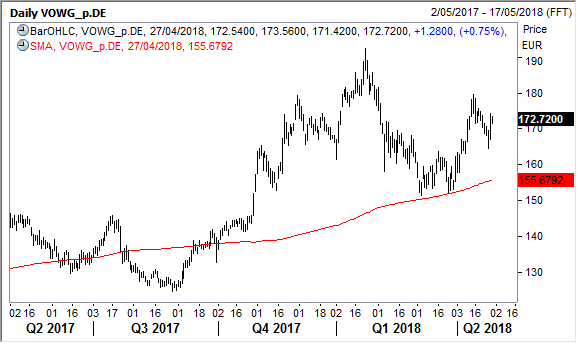 Disclosure: The Fat Prophets Global Contrarian Fund declares a holding in: Baidu, Disney, Caixabank, Telepizza, Volkswagen, Mizuho, Mitsubishi UFJ, Sumitomo, Inpex, Nippon Telegraph and Telephone, Fanuc, Sunny Optical, CNOOC, MGM China, Wynn Macau, Sands China, Mitsubishi Fudosan and Sony.